← Alternative, fun wedding ideas: Have you seen my bucket list? 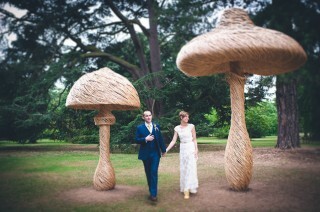 A sneak preview of Jess + Jon’s Kew Gardens wedding! Jess and Jon had a wonderfully intimate wedding in the beautiful surroundings of Kew Gardens' Cambridge Cottage with the wedding theme in Jess' favourite colour- yellow! This article was posted in Real Weddings, Stuff For Married-To-Be's and tagged alice, alternative, beautiful, botanic, Documentary, forest, fun, gardens, Kew Gardens, london, mushrooms, natural, nature, peacock, photography, redwood, relaxed, relaxed wedding photography, royal, wedding, wonderland. Bookmark the permalink. Follow comments with the RSS feed for this post.Post a Comment or leave a trackback: Trackback URL.